Beaten coffee is in my blood. Literally!!! I remember when we were kids and there was a big chunk of a year when the schools had forced holidays due to riots, the holidays were so long that there was even a discussion to cancel the year and re-do next year. But it didn’t come to pass thankfully! During these holidays cousins had gathered at our house for games of cards, horror stories, movies and late night cuppa of beaten coffee. I wouldn’t take the credit for the recipe, I learnt it from one of my older cousin during that time and kept following it over the years. Every night we kids would beat coffee thinking my mom wouldn’t realize what we are doing so late at night and every morning, my mother would call us and simply ask that did we have coffee last night. Me being young, always wondered how does she come to know what we have done after she is asleep. A mom is omnipresent. :D It is now when I am a mom and run a house that I have realized how easy it is to know when someone has used your kitchen. 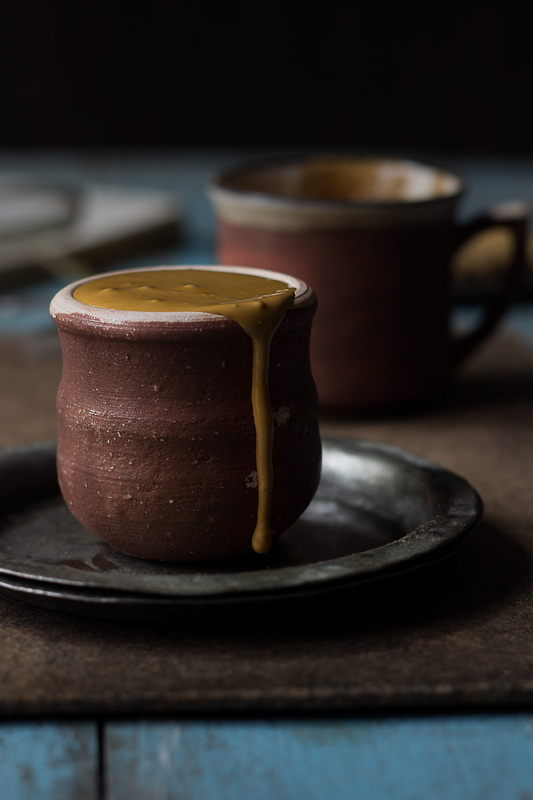 Coming back to the coffee, the recipe I am sharing is the same though, I have introduced using a blender instead of beating with hand to reduce work load. You can do the exact same steps of beating coffee using your hand as well. Now with advent of blenders the job is much easier and faster. While serving, I scoop coffee in the mugs and pour hot milk over it. I prefer letting the guests do their own mixing gently to enjoy the gorgeous froth which this coffee gives. But you can mix and serve as well. 1. In a tall glass or jar, add coffee and sugar. Add few drops of water and using a hand blender, beat the coffee. the mixture will thicken and stay granulated. Add another 2-3 drops of water and repeat the process. Once you achieve a thick emulsion of coffee and sugar with very little or no visible sugar, stop beating. Initially the mixture will be very dark brown but as the beating continues, the mixture will lighten. You can do the exact same steps using your hand as well. That is how I initially used to do but now with advent of blenders the job is much easier and faster. 2. The mixture is not runny but thick for perfect froth in the coffee. Boil milk and cinnamon stick (if using) in a pan and prepare the coffee cups or mugs by scooping about 1½ teaspoon of coffee mixture in each. Pour hot milk on top of mixture in each mug. Sprinkle some drinking chocolate and serve hot. I prefer letting the guests do their own mixing gently to enjoy the gorgeous froth which this coffee gives. But you can mix and serve as well. Recipe from the repertoire of family recipe. You can use 150 ml of water and 150 ml of milk or less water and more milk or only milk. Milk makes it heavier beverage, so choose as per your preference. I usually do 50:50 milk and water. You can do the exact same steps of beating coffee using your hand as well. That is how I initially used to do but now with advent of blenders the job is much easier and faster. Add cinnamon stick to get that Barista flavour right at home.